Pharmacy racks need to be designed to perfection as it needs to find an optimal balance between floor space and storage options. It is common knowledge that pharmacies do not boast of plenty of floor space and therefore it becomes important for rack designers to ensure that they design the racks to suit the design and floor space of the pharmacy without becoming a hindrance to the regular work process. As a matter of fact, it becomes important to design the racking system in such a way that it complements the workflow. Adequate Steel offers the ideal racking system that has been designed considering all the nuances that pharmacies have to deal with in their workflow. By offering four different standard options for pharmacies Adequate Steel covers all basics that are required for any pharmacy. The designers at Adequate Steel have given good thought about the needs of the pharmacy that are; proper storage, workflow and the promotional angle. 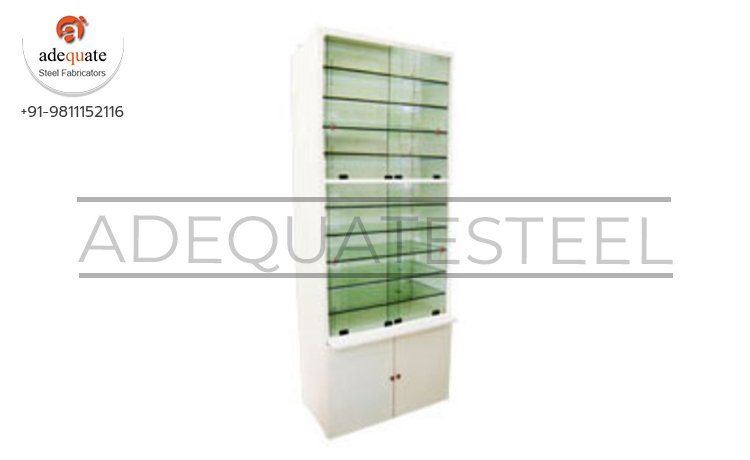 The four standard options from Adequate Steel are; Slat wall racks for prominent displays, pharmacy racks with top storage facilities, pharmacy racks with bottom storage facilities and metal showcases. The metal showcases are very similar to that of a regular showcase only that it is not a complete showcase from top to bottom but has a storage facility in the bottom which facilitates easy storage.